Flags featured as a single monitor video installation in the exhibition of new work by contemporary sound artists, forming part of The Engine Room, a festival celebrating the life and work of Cornelius Cardew. The soundtrack was composed by Tim Howle, Head of Art, Professor of Contemporary Music at the University of Kent. 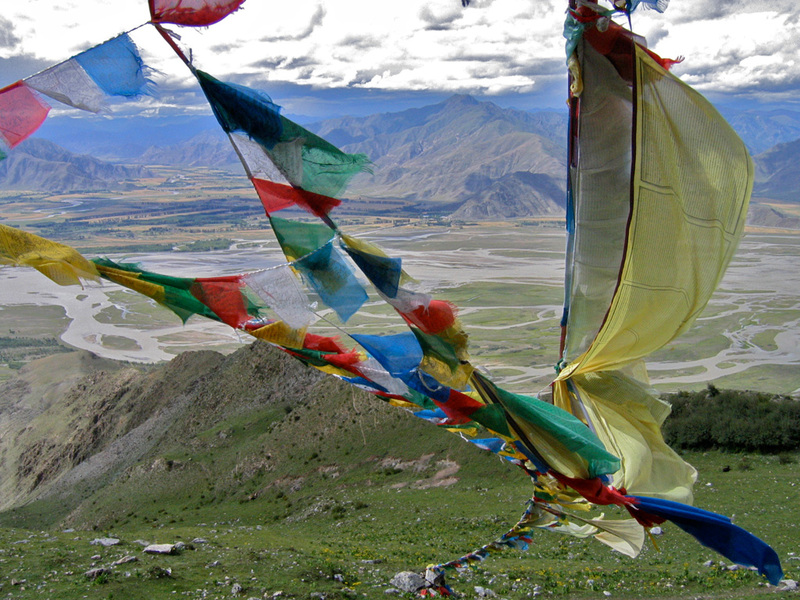 The video consists of just two shots of Tibetan Buddhist prayer flags, strung across the path (‘kora’) circumambulating the mountain top of Ganden Monastery, near Lhasa, Tibet, filmed by Nick Cope in August 2005. An initial opening, establishing wide shot of the flags in the landscape soon fades to a continuous four and half minute take, panning across the length of the 50m string of flags and closes up into them as the wind blows them through the frame. Symbols and mantras are printed onto the flags in the belief that prayers of compassion, peace and healing will be carried on the wind for the benefit of all, blessing those to whom the prayers are carried. Using visual techniques analogous to methods of electroacoustic composition, Flags builds on a series of successful collaborations between the two practitioners. The first draft of the music is a simple synchronization of sound and image. Through re-ordering and superimposition, successive versions of the sound are progressively distanced from their origin – creating a palate of sonic material that functions both ‘in’ and ‘out’ of the frame. Musical phrases mirror the behaviour of the flags and also act as a sonic version of the visual landscape corresponding to distance and depth of field. Out of sight in trees behind the shot, there are thousands more flags all of which have individual prayers written on them. In front of the lens, the flags form a collective image that is not fixed yet has a predictable behaviour. The rope on which the flags are connected acts as a fundamental frequency. The formal musical elements within the piece are inspired by Cornelius Cardew’s Autumn 60 for orchestra; quasi-improvisation is used in the creation of themusical phrases and on a more structural level, sections of music have a limited indeterminate relationship with each other. The approach is free within prescribed limits. The work builds on earlier explorations of the encounter of electroacoustic music composition and moving image practice by Tim Howle and Nick Cope in the four ‘electroacoustic movie’ works from 2002-2008, which have been widely screened nationally and internationally, and published on DVD. Screening: The Centre for Digital Art and Experimental Media (DXArts), Washington State University, Seattle, USA, 22nd February 2013. A celebration of the life, works and legacy of experimental musician and composer Cornelius Cardew, organised by Morley College and supported by the Southbank Centre. The festival programme included a mix of performances, improvisations, exhibitions, courses and workshops, and culminated in a weekend conference on 10-11 December 2011. Cornelius Cardew (1936-1981) was a tutor at Morley College in the late 1960s and early 1970s, and left a lasting impact on the College as well as the wider British contemporary music scene. He was widely known in Britain and throughout the world not only for his avant-garde compositions but also as a political composer and for his position in contemporary music. As a musician and concert organiser he was responsible for many first performances including Boulez’s “Structures ” with Richard Rodney Bennet at RAM; as well as the music of Cage, Stockhausen, La Monte Young, Terry Riley, Wolff, Rzewski, etc. Flags re-works an earlier edit of the same video material, Ganden Prayer Flags, originally cut with a soundtrack by Phil Thornton, and selected for screening online as part of The Portable Film Festival: Worldwide Encounters: Lonely Planet TV in 2009.